Catching a killer is dangerous—especially if he lives next door. Finally, she’s found some stability and peace. 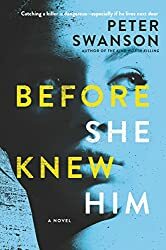 Hen knows because she’s long had a fascination with this unsolved murder—an obsession she doesn’t talk about anymore, but can’t fully shake either. The more Hen observes Matthew, the more she suspects he’s planning something truly terrifying. Yet no one will believe her.